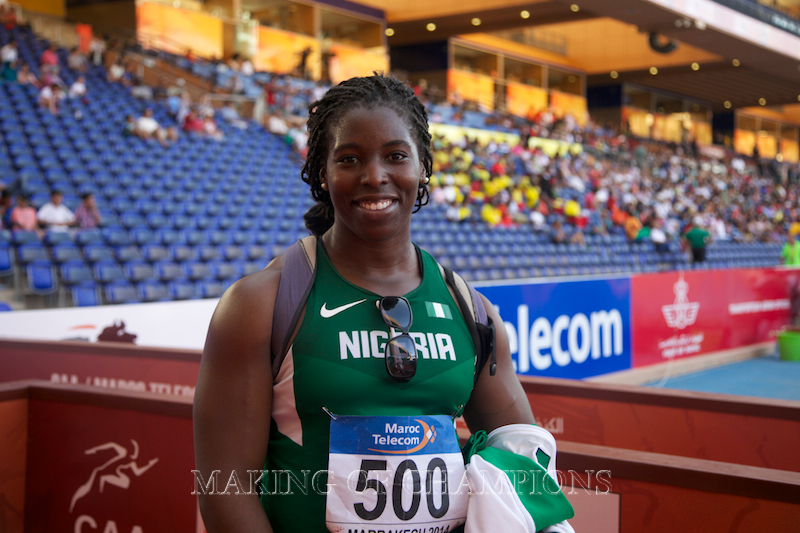 It was a close call between Okoro and fellow discus thrower and shot putter, Stephen Mozia on who to take this position, but Okoro’s outstanding performance to win GOLD and defend her African title from 2012 by throwing a Personal Best (PB) and Championship Record (CR) of 59.79m in the discus throw stood her out – she had gone into the championships with a Season’s Best (SB) of 57.83m and PB of 58.25m. She also won the silver medal in the shot put with an SB of 16.40m, while Mozia got bronze in the men’s discus (57.11m) and 4th place in the shot put! After an injury plagued 2013, Ogoegbunam came back by winning the GOLD medal in the 400m hurdles at the Nigerian Championships in 56.77s. At the Commonwealth Games, she qualified for the final where she would have run a PB but was disqualified alongside South Africa’s Theron Nel. She made up for this disappointment by winning the silver medal in a PB of 55.46s at the African Championships. Her PB is ranked 23rd in the world this year. He came into national recognition at the Nigerian Trials after winning the 110m hurdles in 13.66s as one of several newly recruited Americans to Team Nigeria. He inspired a 1-2-3 finish for Nigeria at the African Championships where he won GOLD in 13.57s ahead of Alex Al-Ameen and Martins Oghieriakhi, which turned out to be his first silverware for his adopted country. 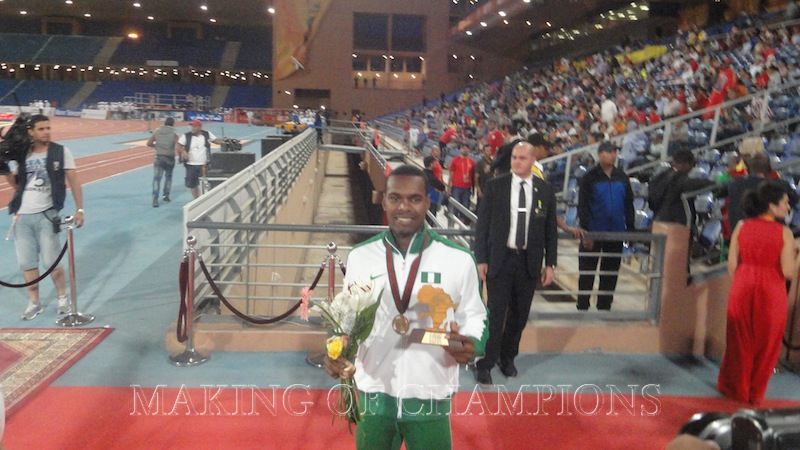 He is also the first Nigerian to win the event since national record holder, Williams Erese’s triumph in 1996. He finally capped his season with an SB of 13.48s to finish 5th at the Continental Cup. Akins gets on the list because of his steady progression of his time for the country throughout the season – can he get back to his PB of 13.25s set in 2008 as a US athlete? Only time will tell – we wish him all the best repping Team Nigeria. 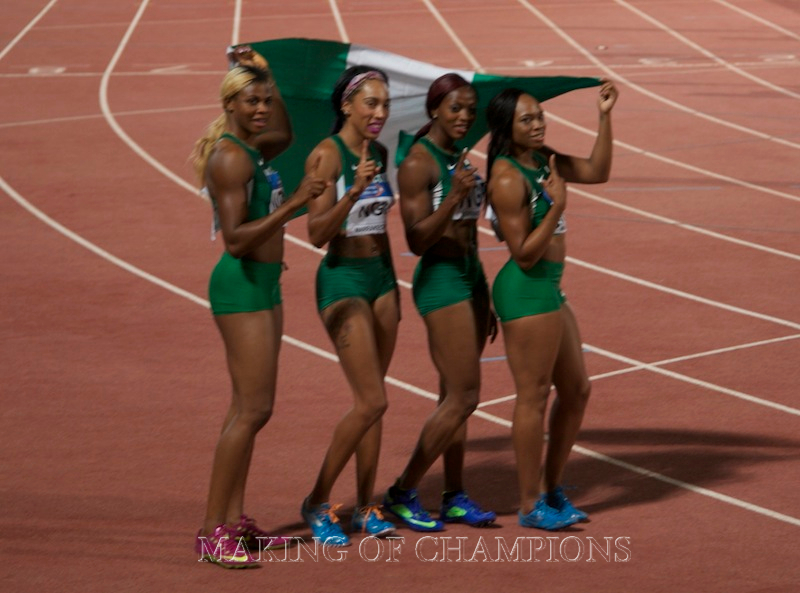 The women’s sprint relay team opened their 2014 campaign by finishing 4th at the inaugural IAAF World Relays in the Bahamas with an SB of 42.67s, coming within a hundredth of a second of the Bronze!, That team included Team Nigeria stalwarts Blessing Okagbare and Gloria Asunmu, and a couple of first-timers, Francesca Okwara & Dominique Duncan. 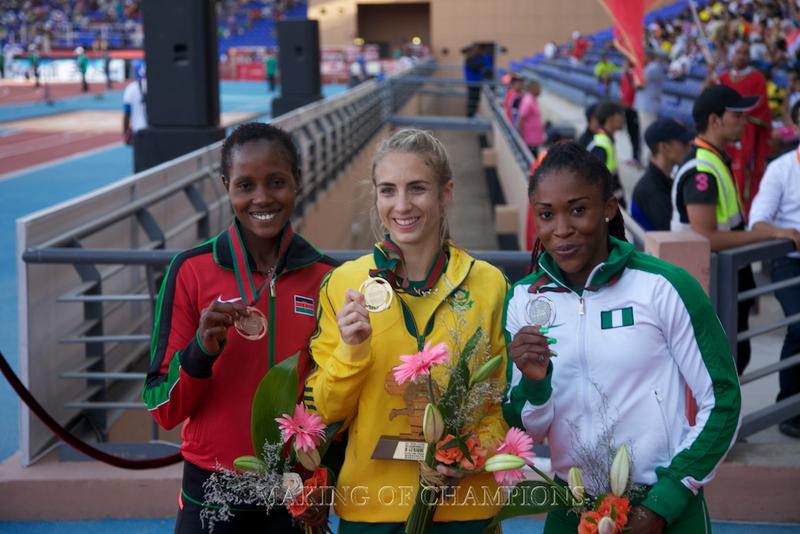 Since then, the returning Lawretta Ozoh replaced Okwara on the team, and led by Okagbare, they raced to a Commonwealth Games silver medal in 42.92s behind Jamaica, before capping their season with a fifth consecutive title at the African Championships in 43.65s, proving their dominance in Africa in the event. 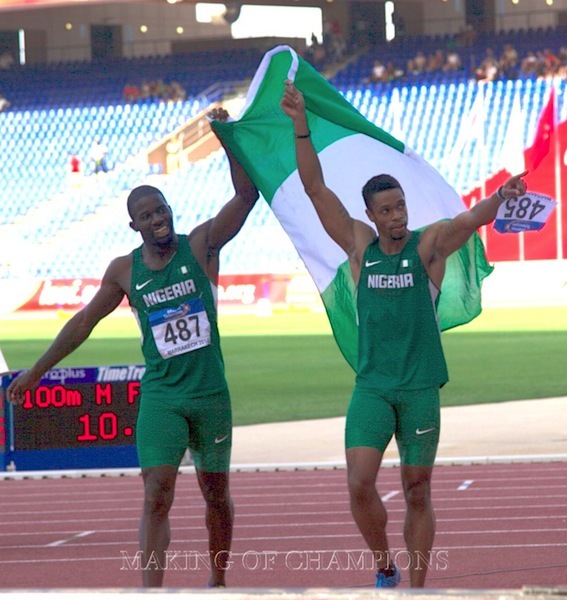 Special commendation should go to Duncan, who capped off a good first season for Team Nigeria with not just these two relay medals, but a surprise African 200m Bronze medal, ahead of teammate and defending champion Asumnu. 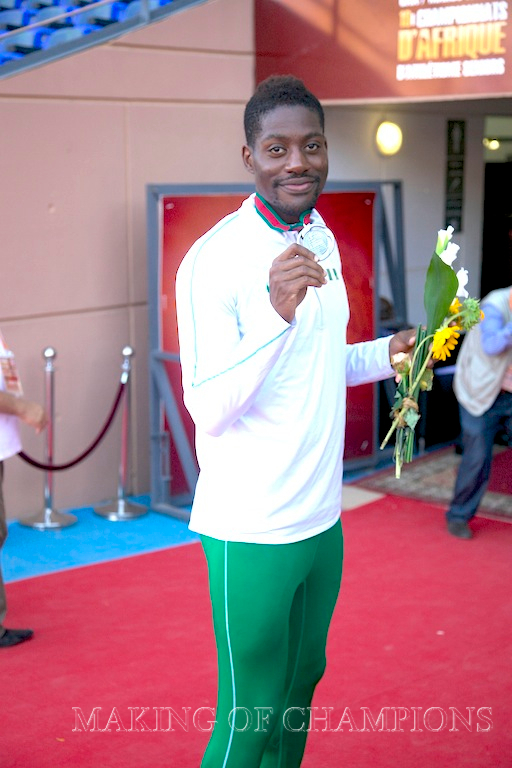 Morton is Nigeria’s fastest 400m hurdles athlete in recent years. He is the national champion in the event and his time of 49.65s was enough for a 5th place finish at the Commonwealth Games. Though he lost his African title to South Africa’s Cornel Fredericks, he was able to take the silver medal by breaking the 49s barrier for the first time this season with an SB of 48.92s at the African Championships. Finally, he raced to a 5th place finish in 49.65s at the Continental Cup. His SB is ranked 18th in the world this year. Just like Akins, Jelks came into national prominence when he emerged the surprise winner of the men’s 100m event in a time of 10.23s, beating tournament favourite, Ogho-Oghene Egwero to the title in Calabar – he has perhaps been the most impressive of the newly recruited American athletes. Tipped as a potential medal winner at the Commonwealth Games, he finished 5th in a much improved time of 10.13s. At the African Championships, he had the fastest time in the semis in 10.16s before eventually losing out on the GOLD medal to surprise winner, Cote d’Ivoire’s Hua Wilfried Koffi, despite running an SB of 10.07s (Koffi won with 10.05s). He Jelks also anchored the men’s 4x100m relay team to a GOLD medal finish at the same Championships in 38.80s. At the Continental Cup, Jelks narrowly missed out on a podium place as he finished 4th in the 100m in 10.12s, before anchoring Team Africa to a 3rd place finish in men’s 4x100m relay. His SB is ranked 35th in the world this year. Although he didn’t win any individual medal at global championships, he’s been amongst the top five finishers in all his individual races this year and has helped increase Nigeria’s rank in the 100m internationally this year. Can he become the first Nigerian to run sub-10 seconds since Fasuba ran 9.85s in 2006? He will likely need to get back to his PB (9.99s in 2007) or beyond to make either the World Championship or Olympic final in the next 2 years! 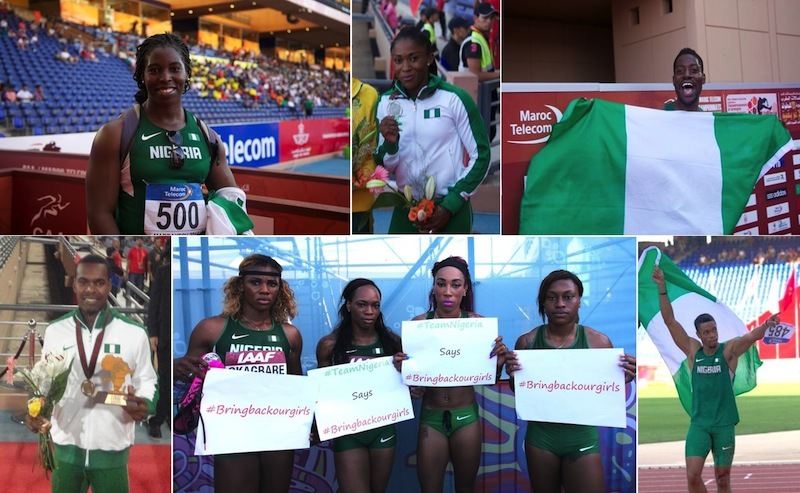 Watch out in the coming days for Part II of Nigeria’s Top 12 Athletics Performers for 2014, where we will count down from No. 6 to No. 1 – Can you guess which athletes they are and the correct order? Look out for our game to predict the correct rankings on our social media sites (Facebook, Twitter, Instagram) for a chance to win AIRTIME!